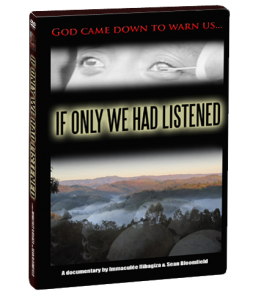 If Only We Had Listened is the powerful documentary by Sean Bloomfield and bestselling author Immaculee Ilibagiza. God sent a messenger to Kibeho, Rwanda to warn about the genocide, but few heeded the warning. Immaculée Ilibagiza knows the story all too well. Nearly her entire family was killed during the genocide, and she survived by hiding in a bathroom with seven other women for three months. Her faith, inspired by the messages of Kibeho, kept her alive. I do believe what is still happening in Medjugorjie since June 1981. Pope Francis, I believe, has not yet approved of the Visions or everything taking place there or has he done so?